The Simplified Resource For Investing and Personal Finance: On Why the Rich get Richer and the Poor get Poorer - The Hyflux Proposal Is Out! 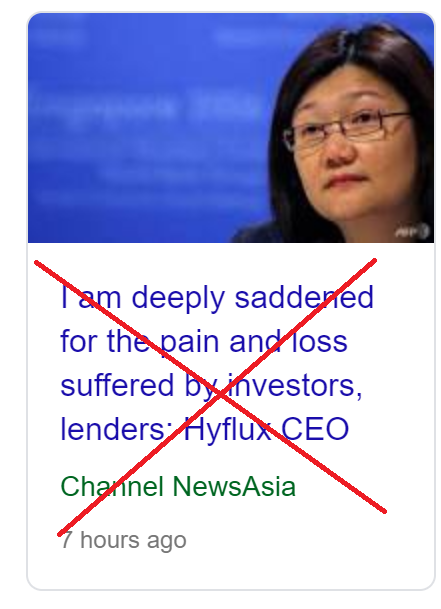 In the vain attempt to make an emotional connection to the retail investors so that we would more likely accept her proposal, this woman called Olivia Lum says "she is deeply saddened". And as an act of showing remorse, she says she will pass to the perpetual and preference investors her 1.26% of restructured shares. I think she knows it is worthless that's why! 1) she would have cut her pay and her BOD's (Board of Directors) pay very much earlier on. She didn't do it and instead defended it, despite numerous pleas and queries during the 2 townhalls by the retail investors. I have written about her pay before here and compared with other Singapore companies such as Ezion when the founders and BOD's voluntarily cut their pay up to 71%, years before the situation blew up. In addition to her pay, she has been earning $58 million in dividends. 2) she would not have quickly given out the dividends in species of the Hyfluxshop in January 2018 to the ordinary shareholders. It is a known fact that there is NEVER any obligation at all to give out dividends to ordinary shareholders. Many companies don't even give any dividends. On the contrary, she was obligated to give the perpetual securities retail investors their coupons in May because of the terms. I wrote about it here and here . The coupons for the perpetual securities retail investors even went EX-DIVIDEND already and yet it is not paid at all. Take note that she owns 34% of ordinary shares and only 0.002% of perpetual securities. Isn't it obvious where her motivations lie? 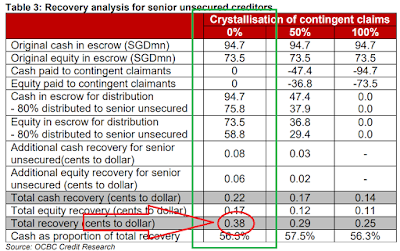 AND SGX AND MAS PLEASE ANSWER : how come coupons/dividends already went ex-dividend and yet it is still not paid? 3) she should have concentrated her efforts to save Hyflux instead of Hyfluxshop. Due to the dividends in species of hyfluxshop, it has become a private company. 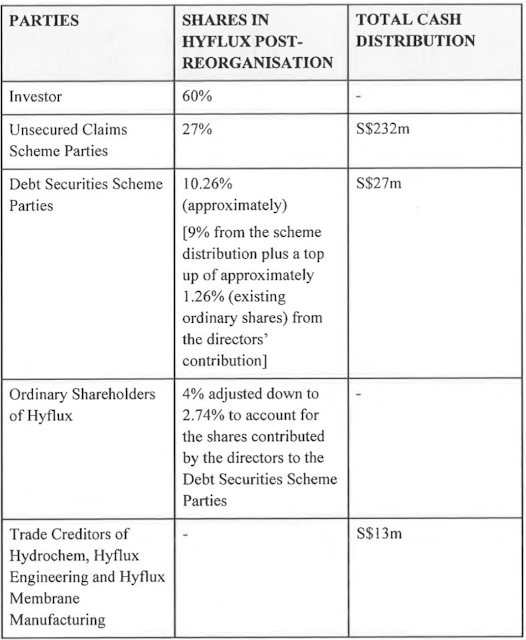 Olivia acquired the remaining shares of Hyfluxshop and now owns more than 76% of Hyfluxshop ( renamed as Elo Water Shop). Hyfluxshop still owes $20 million to Hyflux. Guess what she did at her majority controlled privately held Hyfluxshop , she held contests with cash prizes and a BMW car. Imagine the ridiculousness of it. 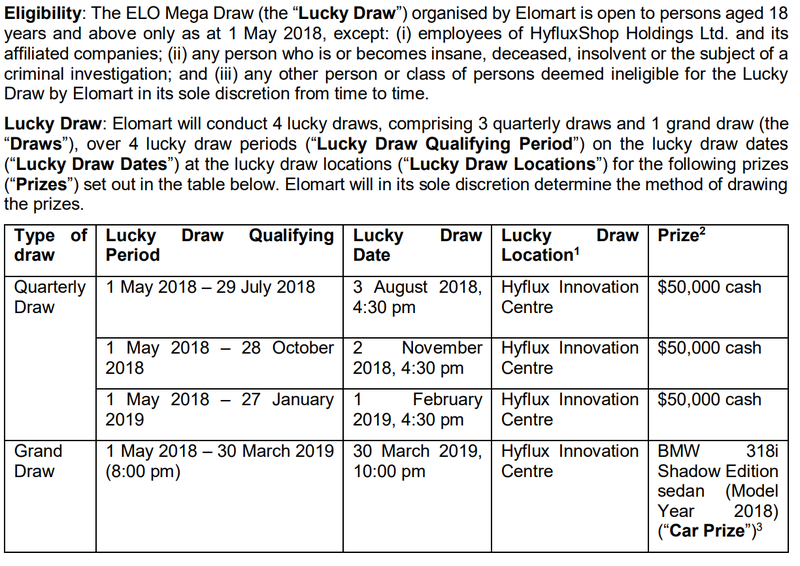 Hyflux, the mother company, is facing a liquidity issue, yet, Olivia is spending cash to promote her Hyfluxshop which still owes $20 million to the mother company. 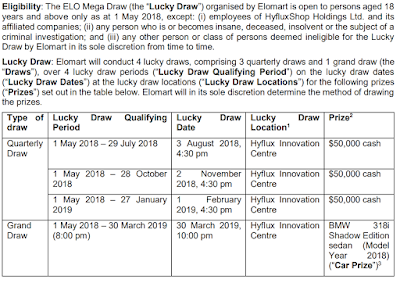 For every $100 , we get back $3 in cash and $7.6** in ordinary shares. 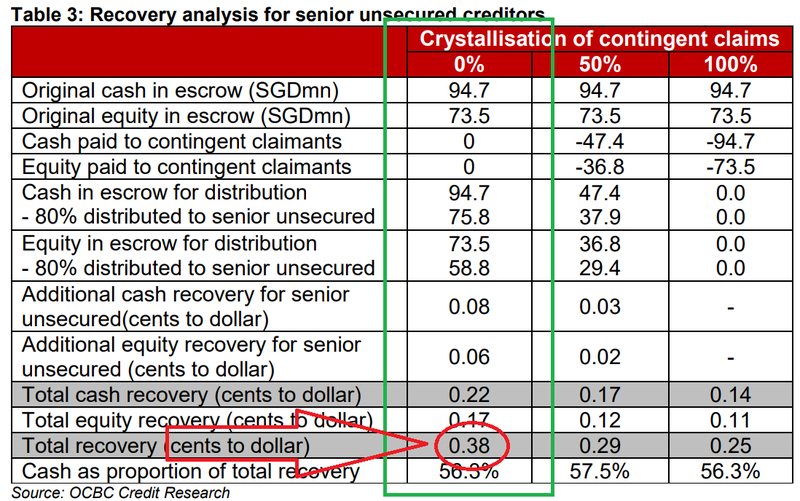 OCBC issued a report that stated that the unsecured creditors should be getting back $38* ( cash and shares) back for every $100 invested. **The ordinary shares valuation is derived from the implied $667 valuation of the whole of hyflux based on offer by Salim of $400 million for 60% of a clean hyflux. This is a very bad deal for the retail investors of the preference and perpetual securities. I actually think it is a very good deal for the unsecured creditors (banks and the accredited investors) and i think they will accept it. The way this whole episode of restructuring is conducted is grossly unfair and not equitable from the beginning. It feels like the deal is shaft down the throats of the retail investors, just because the retail investors , who are unsophisticated and do not have the MEANS are not able to offer their views. In my view , SIAS has done nothing of importance to help retail investors. The two townhalls were mainly for information dissemination purposes. There was not enough time to ask questions. It was even worse in the second townhall when an APP called PigeonHole was used. It does not allow follow up questions to answers that will enable the retail investors to drill down to the truth. It felt in my own view, like an administrative process, probably just to fulfill or satisfy the court that the retail investors were "consulted". The Informal Steering Commitee set up by SIAS for the retail investors was also unheard of. I have not heard from any of them and neither have many others in the Telegram group. Some people mentioned they were made to sign Non-Disclosure forms which could have resulted in them not being able to communicate with us. Then what is the point? Is this for show and for formality sake? However, for the unsecured creditors, their views have been sought very frequently. They engaged lawyers and counter proposed. And the unsecured creditors succeeded in getting a very good deal. Cheers to them. Indeed, the rich gets richer and the poor gets poorer. Vote against the Proposal. It's an insult.